SLPP MP Lakshman Yapa Abeywardena said yesterday they will not allow the present UNP government to bring a new Constitution or make any Amendments to the Constitution at the behest of the TNA or any other political party. “However, we will consider giving our support if the government brings the proposed 20th Amendment as they promised during the previous elections,” he said. Speaking at a media briefing at the SLPP party head office at Nelum Mawatha, Jayanthipura, Battaramulla, yesterday, he said the 20th Amendment is necessary to hold the election on a first-past-the-post system to create a stable and strong Parliament. However, they brought the 19th Amendment to strengthen the powers of the Prime Minister instead of bringing the proposed 20th Amendment as promised. The 19th Amendment had created an unnecessary crisis between the Judiciary, Parliament and the Executive today, Abeywardena said. He also said Prime Minister Ranil Wickremesinghe has promised to bring a new alliance to help those helped him come out of the crisis. “However, we will not allow the UNP government to implement promises given to various parties in and outside Sri Lanka,” he said. 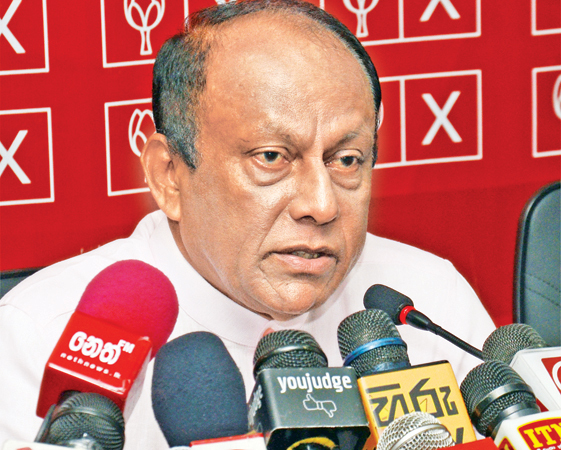 “We will face the forthcoming election as a powerful alliance,” Abeywardena said. “Hereafter we will reveal all the Cabinet decisions that betray the country by announcing them through press conferences and organising public demonstrations,” he said.